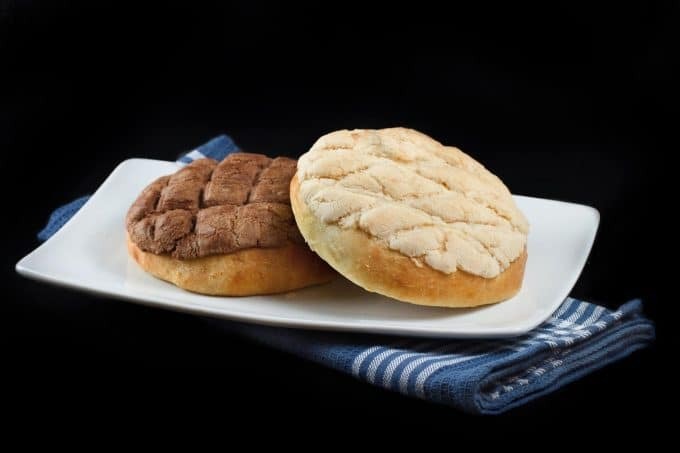 One of my favorite childhood memories is my Grandmother taking me to get Pan Dulce. With this No-Knead Brioche dough I was able to recreate the deliciousness at home. Pan Dulce is a wonderful thing and if you’ve ever wanted a fool proof easy recipe to make these amazing Mexican buns, I’ve got exactly what you’ve been looking for! The best pan dulce are made form a brioche dough and the no knead brioche recipe came out better than expected, creating these delicious buns. It’s been years since I had even thought of those wonderful rolls, and when I saw the recipe for them in Nick Malgieri’s latest cookbook bake!, I knew I just had to make them. The task of making the fresh dough was the only thing keeping me from those incredible buns, then I happened to be going through my Artisan Bread in 5 Minutes a day, and saw the recipe for brioche dough! 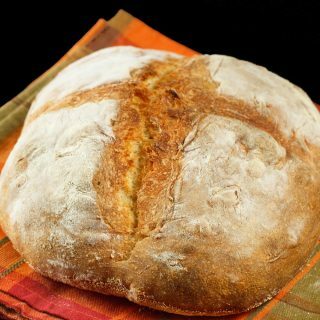 Making this dough took a leap of faith, since other than the artisan bread, I had never baked using yeast before. If you read my last post, Pecan Caramel Cinnamon Buns then you know how good that dough turned out. I made these buns 3 times and they came out perfectly each time. The last batch I made was from fresh dough that had not been refrigerated and they were perfect! I did make them a little too big, and I would advise using no more than 2 ounces of dough for each bun, they make a perfect size to serve with coffee or traditionally hot chocolate! 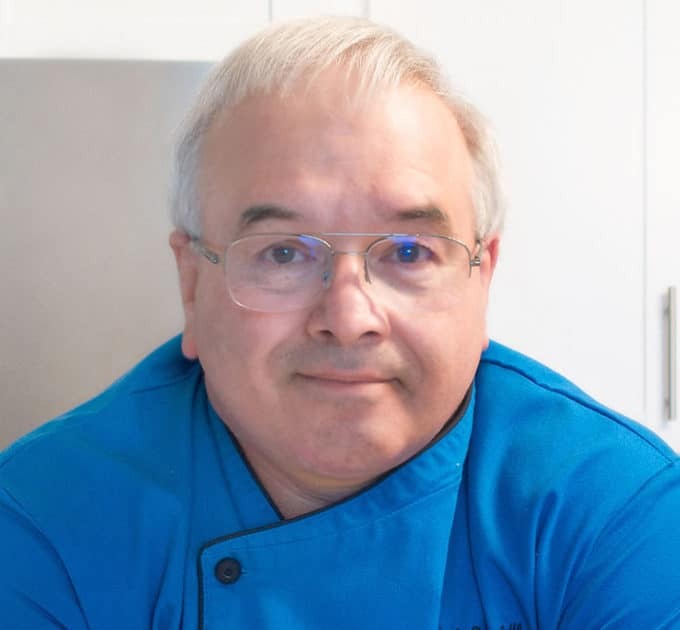 Author: Adapted from Artisan Bread in Five Minutes a Day , and Nick Malgieri's Bake! Add in confectioners sugar and flour and continue to mix until creamy. Add in vanilla and increase speed to whip into mixture. Scrape down bowl and remove half of the mixture. Mixture should have the consistency of a soft dough. Add cocoa powder to remaining dough and mix well. roll doughs on floured surface making logs of each flavor topping. cut out twelve 2 oz pieces of dough, using floured hands roll each piece into a ball, by pulling the dough down and around, pulling it tight at the bottom. 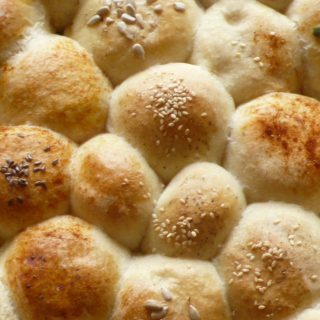 Place dough ball on baking sheet and continue the process until all are done. cover with a towel and allow to rise for 20 minutes. After the rolls have puffed slightly* take each cylinder of the topping and slice into six equal pieces. Flatten the pieces out with your hand until they are as big as the roll top. make any type of cross patterns that you like. Bake for 20 minutes or until the roll is a nice deep golden brown. Tried your recipe cuz one of my grandsons requested me to make pan dulce for his Spanish class dia de los muertos presentation/exhibit. It didn’t disappoint! In fact his dad requested me to bake some more so he could bring some to his co- workers today! That made me feel good! You are very welcome and I’m happy to hear your grandson enjoyed my recipe. That same dough makes some of the best cinnamon buns I’ve ever had, you can find the recipe on my site. I’m so happy to hear that you made those delicious buns… they were a big part of me growing up in Texas, I do love them. The dough is incredible and so easy to make, I don’t know if you tried using it for the sticky buns, but OMG they are amazing! I’ve got the dough rising and I can’t wait to taste test! Question: in the topping instructions it says to add vanilla, but I don’t see vanilla in the ingredients? I assume 1 tsp is sufficient? Thanks! Thanks so much for letting me know, yes 1 tsp will be great! Let me know how they turn out, mine brought back so many childhood memories! Great site! Just ran into Ito this evening! Love the posts and recipes. Do stop by my blog sometime: Annarasa – essence of food. Those buns look delicious! I do have a question about how the texture is on these. 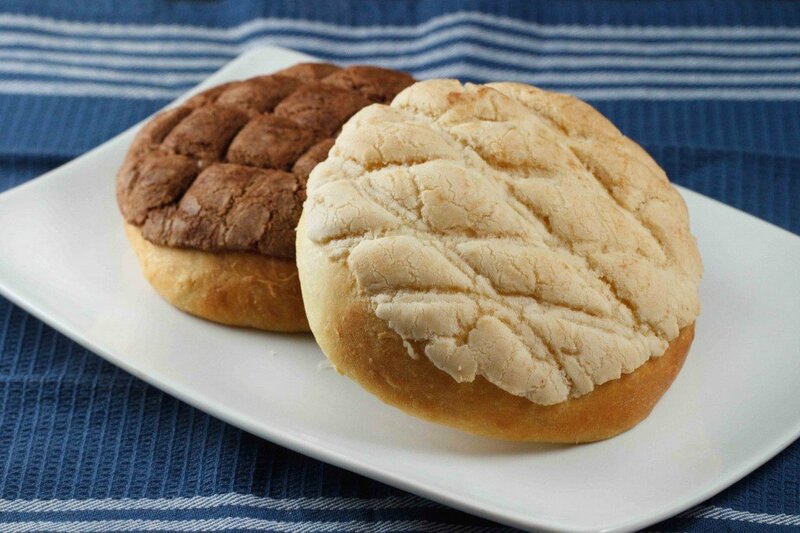 I haven’t had conchas but I do love the Asian-style buns that resemble them (pineapple buns) which resemble these. they have a very nice light texture, soft not chewy, while not falling apart. being that I made them from brioche dough I think their lighter than most. I’m not familiar with the Asian style buns but they do sound very good! Chef Dennis, I did a double-take when I saw this photo! We used to eat at a truck stop (near Laredo) that had an in-house bakery. I could never decide between these two, so I’d get both. 🙂 I couldn’t remember what they were called, so THANK YOU for recreating a very happy food memory. First of all yum! This looks like the perfect comfort food! And Dennis I just now realized that I didn’t update my feedburner when you changed. Oof! All fixed now! Oh boy, this one also always takes me back to my days in Texas. I lived there until I was 35, but as a kid, we would always go down the street to the Mexican bakery and buy these for a nickel! This is the first time I’ve heard of Pan Dulce. Now I want to try it! I couldn’t figure out why I wasn’t getting your new posts, grabbed your url again, so hopefully I can fix it. Love Maggie’s buns I love working with yeast will have to try these. Hope you both have a great weekend. I’m not a huge bread baker. I don’t have the patience for it. And I’m okay with that. I will just come to your house and indulge over there! This looks amazing!! Funny, what a coincidence I made pan dulce 2 weeks ago from scratch for a ‘Mexican breakfast’ theme challenge. I’ve never heard of pan dulce before, but sign me up for anything with brioche! This is SOOOOOOOOOOOOOOO cool! Pan Dulce is very popular here because of my proximity to Mexico. I have ALWAYS wondered how they made the topping! I was so excited to tell my husband! Great post, Dennis! 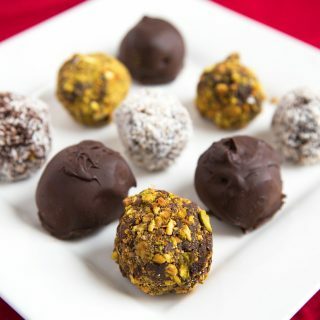 These look phenomenal – I’m going to have to give the recipe a try. I’ve never had this type of bun before, but it looks like something I would LOVE (not that I need another fattening thing to LOVE ;-)). Our friends from Illinois adore Mexican food, perhaps when we see them next time, I shall try my hand at these. Are they a breakfast bun? I don’t think there just for breakfast, these buns are served with hot chocolate traditionally, but go well with coffee, or just about anything! Chef you are amazing!!! I have never seen this before so I am a newbie but man does it look fantastic! You make it look and sound so easy! I so wish I was your next door neighbor right about now! I have always thought that there is a trick to getting these buns just right. Where I worked some people brought these in from bakeries and some were like big crackers and some were pretty tasty. Based on your picture, yours look like they have a wonderful texture-well done. I’ve never heard of these before, thanks for the introduction. Love, love, love this, Chef Dennis! I am hoping to get a concha cutter for my birthday, but in the interim, I really like the way that you scored yours – they look so pretty! Thanks for sharing!! How stinkin cool!!! These look and sound amazing! This is something new for me…….looks so tempting…..Bookamarked. 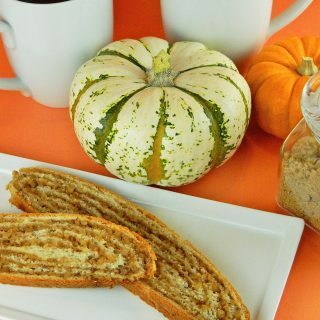 Pan Dulce…!!! Something that I really like is the sweet breads. Thanks for sharing this. This pan dulce looks wonderful, Dennis! Once I got over my fear of yeast, there was no stopping me. This recipe will be next on my list to try. 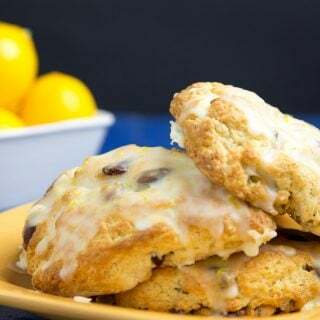 Yum, I’ve never made these and I’m looking forward to it! I sure wish I had one right now with my cup of coffee. It would complete my coffee moment! OMG! this sounds fantastic! it remembers my granny too, and my childhood, the breakfast with “chocolate caliente y pan dulce” omg, more than water in my mouth I have a tear on my chick, beautiful memories, thanks for share the recipe!! What a fantastic post and the pictures make my mouth water. It is great that you mentioned Maggie’s giveaway. The items she has are so cute. 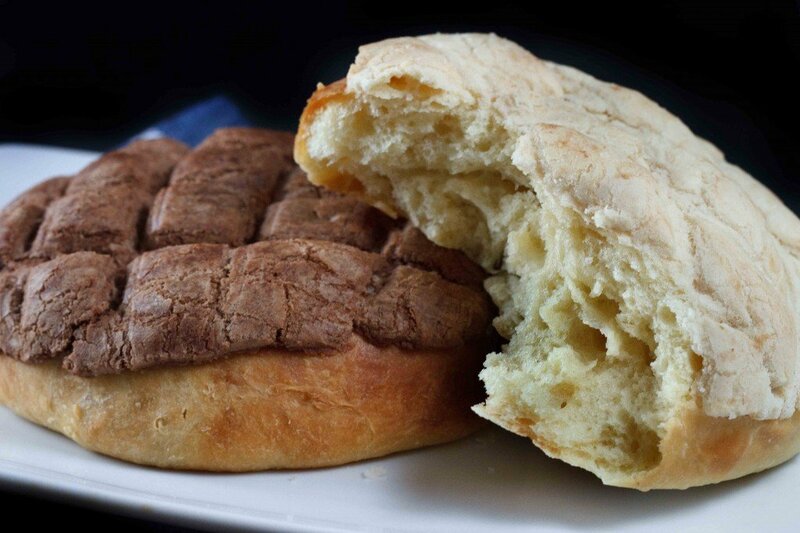 i never realized you could make pan dulce from brioche dough… the wonders of brioche keep on amazing me! I’ve never had this not have I heard of it! These look so incredible!! These look fabulous! When I was a kid, living in New Mexico, I had them….but I’ve never seen them since. I’m thrilled to see this recipe! I adore Maggie and her blog and I’ve already entered for her giveaway! on this month they make them green white and red like the mexican flag!